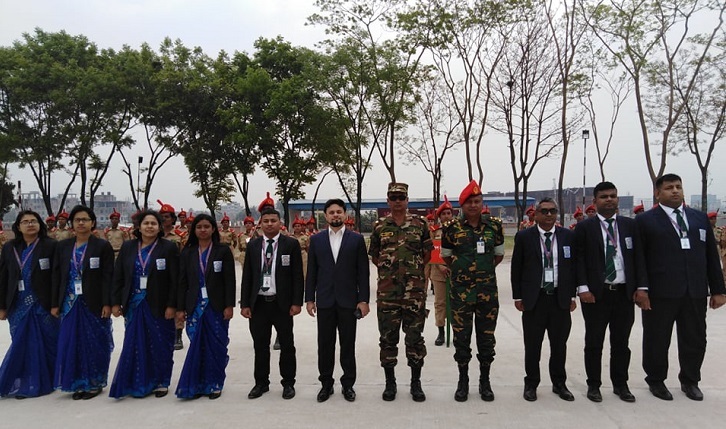 Newly-inducted teachers of Begum Rokeya University, Rangpur (BRUR) visited the cadet's parade of Bangladesh National Cadet Corps (BNCC) on Tuesday morning at Savar, Dhaka. Major Harun-Ur-Rashid welcomed BRUR teachers as a representative of BNCC. He appreciated the BNCC activities and urged the teachers to join BNCC to contribute for the country using merit and competency. He also said the foundation course for BRUR’s newly appointed teachers will bring some positive changes in teaching and learning process. Among others Major Ataul Haq, Captain Ahsan Habib Munshi, Dr. Saber Ahmed Chowdhury, Member, Board of Governors of Dr. Wazed Training and Research Institute, BRUR, Assistant Professor Md Abdullah-Al-Mahbub, Lecturer Md Sanjid Islam, Mehnaz Abbasi Badhan, Sirajum Munira, Mujahidul Islam, Farzana Jannat Tohshi, ABM Nurullah, Md Sarwar Ahmad and Beauty Mondol were also present. The teachers also visited the BNCC archive.